The lower James River area of Virginia is one of the most interesting locations for immersion in eighteenth century life in the USA. 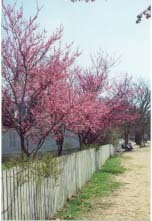 Williamsburg, the showpiece of the peninsula, was the capital of Virginia from 1699 until 1780, and as such was the cradle for independence from Britain. There are a number of area sites that are important to early American history including Jamestown Settlement, Yorktown Battlefield, restored Colonial Williamsburg and the James River plantations. The area has a broad appeal. While there are an array of excellent entertainments geared to families, the sophisticated visitor can partake of fine dining, romantic accommodations and world class museums. Williamsburg is also fast becoming one of the honeymoon capitals of the USA. The first thing to do is to write Williamsburg Convention & Visitors Bureau for an information package, then plan your holiday carefully. You can spend more than a week in the area. Less crowded times to visit are January through March, June and September. During peak seasons "Colonial" streets and all amenities can be crowded. There are accommodations to suit all tastes and budgets and it is a good idea to make arrangements well ahead of your visit. Book up to a year in advance if you wish to stay in an accommodation run by the Colonial Williamsburg Foundation. When you arrive, follow the signs for Colonial Williamsburg Visitor Center to obtain information, maps and admissions passes to the restored area. There are various passes to choose from depending on one’s level of interest in "things heritage’. If walking the historic streets is as involved as your want to get, that’s free. 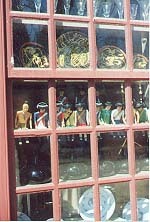 Today there are eighty original and more than four hundred reconstructed buildings in Colonial Williamsburg. 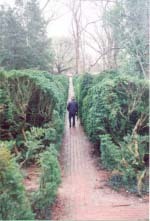 A pass is definitely needed to visit certain restorations and gardens. While at the Visitor’s Center, watch the thirty-seven minute film "Williamsburg" that gives an excellent introduction to the site. If you want to eat in one of the restored taverns, take time to make reservations while at the Visitor Center. Leave your car in one of the Center’s lots and take the special bus, or use the handy map provided by the Center to walk the short, but interesting path to the restored area. Interpreters and costumed staff are located throughout the "village" to answer questions and point visitors in the right direction for the many and varied programs. Be sure to take in the free daily activities that are listed in "Visitor’s Companion" a weekly "paper" that is published by Colonial Williamsburg Foundation. Some specialized programs do have an admission fee, but there is plenty to do and see that is free. Many of the Foundation’s programs are geared toward families with children. As their advertising slogan says - "Time stands still here. You, however, will not." We spent two full days in Colonial Williamsburg enjoying well-presented total immersion in the re-enacted c1770's transitional period in American history. The seeds for independence are still being sown, as British flags fly proudly throughout the restored area. Visitors are rather startled to see the Ensign until they realize the gesture is most important to history as presented by excellent restorations and interpreters. I was in the Mary Still House visiting with Anne Getty, a widow who was talking about her life when the impact of Colonial Williamsburg really struck home. I was so involved in the "chat" that for a moment I forgot it was not the 1770's but the first year of the 21st century. Colonial Williamsburg does that to people. Hubby and I spent a half day on the James River at Jamestown Settlement, a living history museum with its 17th century Powhatan Indian Village and reconstructed James Fort replete with replica sailing ships - "Susan Constant", "Godspeed" and "Discovery". A short drive east on the Colonial Parkway brought us to Chesapeake Bay where Yorktown Victory Center and Yorktown Visitor Centre with its battlefield consumed another five hours. We also spent an enjoyable day touring the James River plantations, but chose to do this on our way "up-river" toward home. I highly recommend "Sherwood Forest Plantation", "Shirley Plantation" and Berkeley Plantation. Plan your visit to Berkeley to include lunch in the Coach House Tavern. 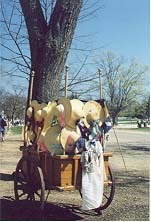 Those not too interested in history, can enjoy a number of other attractions, among them the beautifully maintained, family-oriented Busch Gardens with thrilling rides and themed "villages", The Music Theatre of Williamsburg, Williamsburg Pottery Factory, The Candle Factory and a number of outlet malls. Area restaurants offer a wide variety of prices and variety. 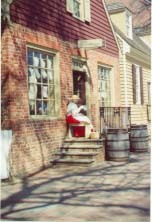 We had several memorable meals at taverns in the restored area, and enjoyed an elegant dinner one evening at Colonial Williamsburg Inn.